A Sit and Go Poker Tournament is a mini Tournament with no scheduled start time and a fixed number of entrants. There’s no waiting around, as soon as the required number of participants have registered then the Sit and Go will start. Sit and Go Tournaments are often referred to in a number of ways, Sit and Go, Sit N Go, SNG, they all mean the same thing. Sit and Go Tournaments are extremely popular online. They require a lot less of a time commitment than a full multi-table Tournament, small sit and go Tournaments can be completed in less than an hour compared to a full multi-table Tournament that may take 3 or more hours to complete. Single Table Sit N Go – 1 table of 9 or 10 players. Multi Table Sit N Go – Multiple starting tables for up to 180 players that reduce as per a normal Tournament down to the final table. Standard Sit N Go – just like a standard Tournament with a certain % of the players being awarded prize money. In a single table Tournament this is usually the top 3 players, in multi table Tournaments it will be approximately the top 10% to 20% but will vary. Fifty/Fifty Sit N Go – a variant offered on some poker sites where the Tournament ends when half of the entrants have been eliminated. The prize pool is then awarded to the remaining winning players based on their chip count at that point. So the player with the highest chip count will receive the highest prize and the lowest will receive less. Double or Nothing – in these SNGs the Tournament ends when half the entrants have been eliminated. The remaining players are then awarded a prize of double their original buy in. Steps Sit N Go – these Tournaments are tiered which allows you the opportunity to win a high prize for a small buy in. You start off in a stage 1 Step Tournament with the winners being awarded free entry into a step 2 Tournament and carry this on until you reach the final step where the prize money is awarded. You can also buy in at any step level, but each step costs more to buy in than the previous. 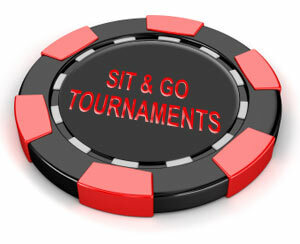 Satellite Sit N Go – the prize in a satellite Tournament is entry to a higher buy in Tournament. These are often run for the big online poker tournaments and also offline tournaments held in casinos. They are a great way to win an entry into a higher buy in event that otherwise would be outside of your bankroll limits. All Tournaments can also be played in “Turbo” mode. This is where the blind levels increase faster than usual and leads to a quicker finishing Tournament. So… How do you play a Sit and Go Poker Tournament? Sit and Go tournaments are designed as a quick option for poker players and you should never have a problem finding a suitable SNG and getting under way within the next 10 minutes. You will find Sit N Go Tournaments available for all variants of poker games and betting limits, the most popular being No Limit Texas Holdem, but less popular games are also available, they just may take a little longer to gather enough players to start. Once you have decided on what type, limit and stakes Poker Tournament you want to play in then its time to find a suitable Sit and Go Tournament. If you haven’t yet chosen an online poker site to play at then see our Play Poker section where we can recommend to you an online poker site that is trusted and also offers regular Sit and Go Poker Tournaments. 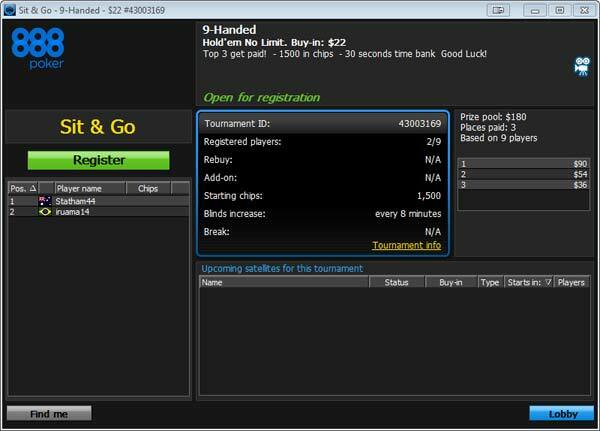 Load up your chosen online poker site’s software and select the Sit & Go Tournaments tab where you will find a list of all available SNGs available to join. Depending on your chosen software you may be able to filter the list to show only the types of Tournaments you are looking for. Look down the list and find a suitable Tournament that you would like to play. Double click on your selected Tournament to bring up the Sit and Go “Tournament lobby” window. In the Sit and Go Tournament lobby window you will find all the details about the Tournament such as the current status of the Tournament, the payout structure and a link to access the full details of the Tournament structure such as the blind levels. 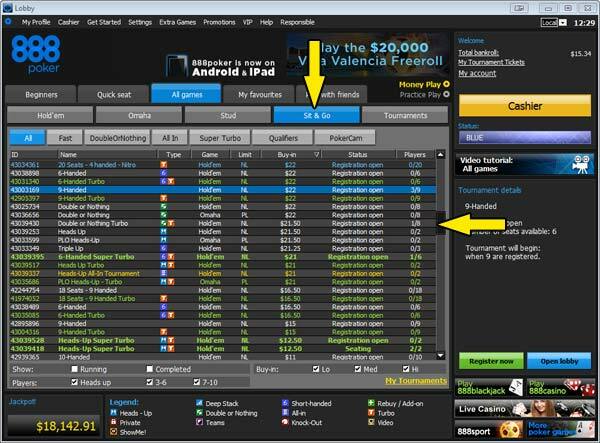 Check the details such as the game type, buy in amount and payout structure and ensure it is what you are looking for. Once you are sure that you have selected the right Tournament then all you have to do is click on the Register button to enter the SNG. If you change your mind or make a mistake then it is easy to withdraw from the Sit and Go as long as it has not started yet. Just click on the Unregister button and your buy in will be returned to your bankroll. For a short tutorial in selecting a game from the lobby at an example online poker site 888poker click play on the following video. There are many reasons why Sit and Go Tournaments are so popular. Players who are just looking for a short game of poker and enjoy Tournaments can load up an online poker site and be sat playing a Sit and Go within minutes, and they can have it all wrapped up within the hour. Sit and Go’s are also for a fixed buy in amount, so you know exactly how much money you are risking before you start to play and are offered in low, medium or high stakes to suit everyone’s budget. So if you are looking for a fast and fun way to play online poker then we can highly recommend Sit and Go’s to you, they are our favourite if we only have an hour or so spare to play. We recommend that you now visit our Play Poker section to get started playing Sit and Go’s at an online poker site. Practise is the best way to learn, so select a low value stakes single table SNG and try it out until you are comfortable. Then you can start to experiment and try some of the other types of Sit N Go Tournaments.